Looks like it's time to generate up another new font. This time incorporating the glyphs for the Town Guard game rules. Up until this time, I've been using Photoshop with different layers holding text, while other layers held glyph symbols. It will take a bit of work to set up the font, but it will save a lot of hassle in the long run. 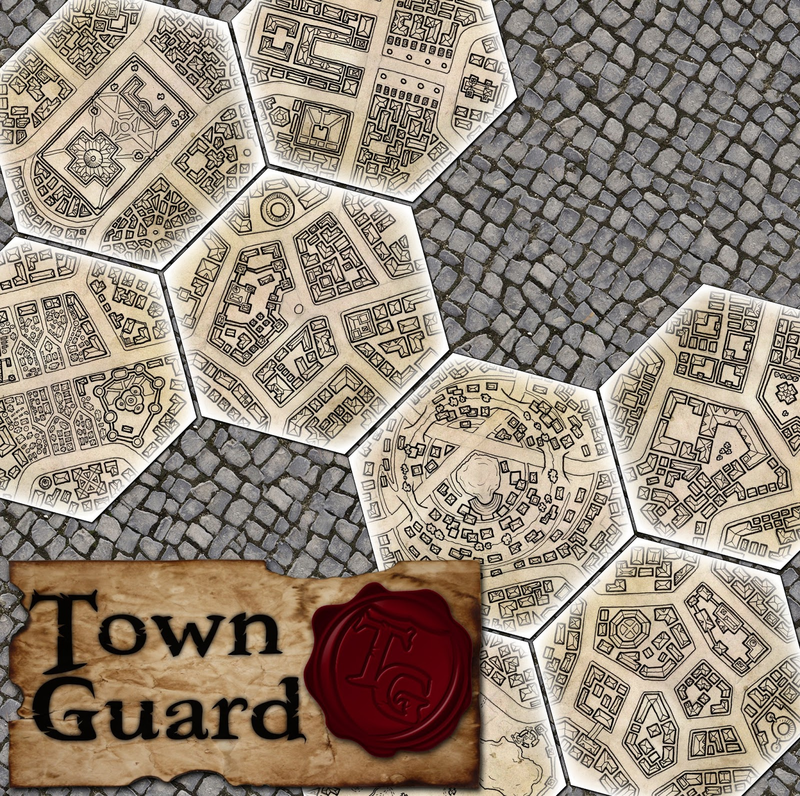 After a bit of feedback, and a restructure of the game, I'll be making changes to the hexagonal geomorphs used to construct towns in 'Town Guard'. At the moment, there is a big hexagonal ghosted area at the centre of the tile. This ghosted area holds the name of the tile location, a keyword or two, and possible some kind of modifier for missions. The changed structure will open up the centre of the tiles again, and make a subtle but noticeable change in the gameplay. Now, there will be two or three smaller labels. 2. A local threat/complication, which modifies missions confronted in this location. 3. A regional threat/complication, which modifies all missions confronted across the town while there is an unresolved mission on this location. 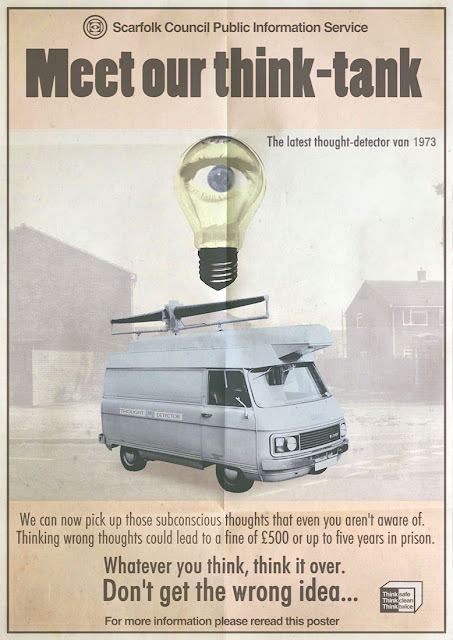 The first round of feedback for Town Guard was great. There were a few interesting points raised. One of which stated that the game looks pretty cut-throat and competitive, but very random. This can lead to some ill-will at the table beyond the control of the players, but which ends up getting focused between the players...a bit like Monopoly. A way to remedy this could be to make gameplay co-operative as well as competitive; change the game in such a way that the mechanisms challenge the players. This means that the players can lose, and if the game takes certain twists the players will need to cooperate to prevent this happening. Then they can compete once they have things under control. This works thematically within the game because there is always the chance that the criminal elements of the town might take control while town guards are busy fighting among themselves. It wouldn't take much to tweak the game in this direction. I love getting playtest feedback, even if that feedback says that a game needs a lot of work to bring it up to scratch. I've just recieved some feedback along those lines for 'Town Guard'. The good news is that there's plenty of time to get things fixed before the contest is judged. I think I've generated the general box art for Town Guard. There are a few elements missing, but this is the basic idea. I'll probably be adding in a picture of a pair of town guards in the top corner, one male, one female. Maybe put them in some kind of "Law and Order" pose. And now that I'm near a computer capable of attaching images to posts...here's a few of my favourite illustrations by Quinton Hoover. One of my favourite artists associated with Magic: the Gathering has passed away. I for one, think that his contributions were one of the things that really made the game something special in it's early years. 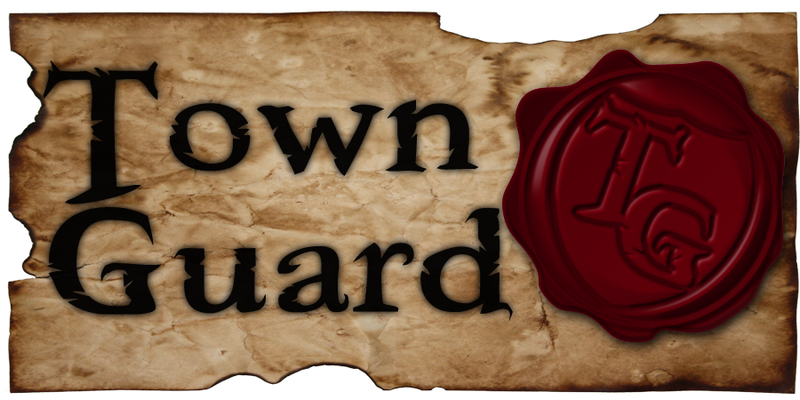 The first draft of the complete "Town Guard" playtest rules is now available. If you want to play it, you'll need to print it out and get a pair of scissors to cut out the various cards and tokens. But if you could do that and provide some feedback, it would be greatly appreciated. I'm hoping to provide some kind of benefits for playtesters (perhaps a cheap copy of the game when it's formally released). Town Guard is nearly complete. The playtest kit is only a few hours away from completion (hopefully). 12 character trait to combine with 12 character races...that's 144 possible characters to play with. In the final version, the figures will be plastic, and the rest will be printed on card. All the hexes have now been drawn up, labelled and basically coloured. These are being added into the playtest document now. If you're interested in playtesting the game, let me know. Here's a few more ideas for finished hexes to be used in the Town Guard game. 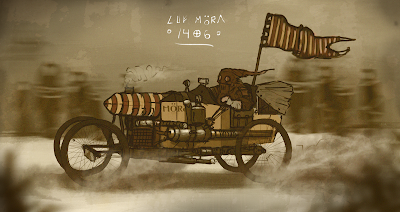 ...and an alternate colouring scheme. This method of colouring adds quite a bit of time to the production of the hexes, and I'm not sure how much it really adds to the final product. But it's all a work in progress at the moment. It's always nice to see artists with a distinctive style. Especially when they are creating pieces that could easily fit into the world you are developing. I went looking for ideas along the lines of "Town Guard" and I found the blog of Martin Reimann. A lot of the work I'm seeing over there could easily be integrated straight into my Walkabout setting. If the crowd-funding is successful later this year, he might be someone I approach to produce some illustrations for that game setting. 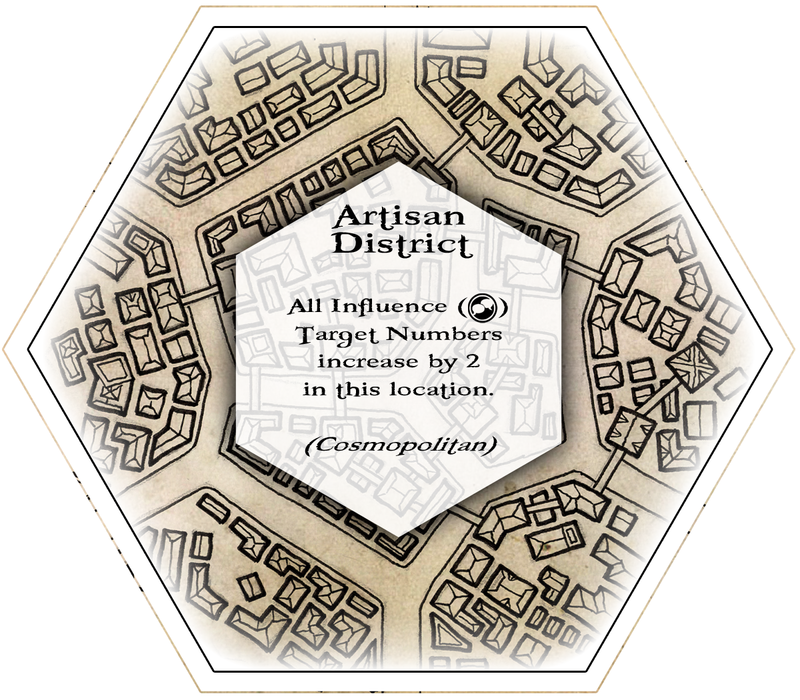 While I'm posting things today, here's a preliminary version of a location hex for Town Guard. 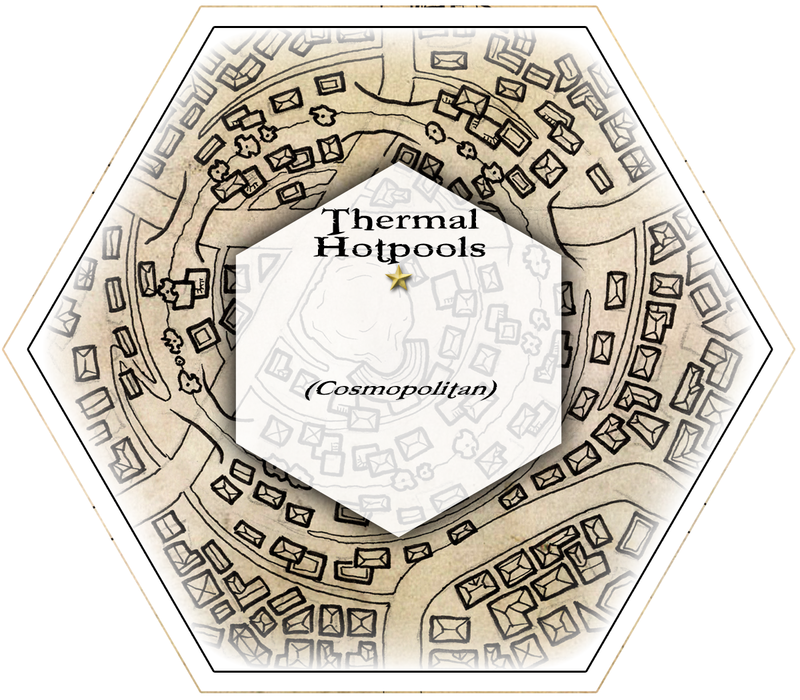 A typical game will be played out over six to ten of these hexes, laid out together to form a basic town map. Different locations have subtle different effects that modify game-play in some way. I've refined the card design for the trait cards in Town Guard. These "trait" cards combine with a "race" card to give a basic character in the game. The "race" cards were ready to save tonight, but the core Photoshop file (with a few dozen layers on it) somehow became corrupted when I tried to extract the individual cards from it. So, I'll have to rework it. You'll note that there are some standardised glyphs that are now in use throughout the game. One each for the attributes, two for the core resources (gold and honour), and a few for the types of items and benefits that characters might gain through the course of the game. I've had enough interest in the roleplaying potential in this game that this could be a future avenue for exploration. But, enough projects on my plate for the moment. I've added roofing contours to the buildings on the "Town Guard" maps. Now it's time to start colouring them and then to add them into the location hexes. These will form the basic twelve hexes that will come in the starter game; I've also started drawing up a few bonus hexes that might be available if this game goes the crowd-funding route. For those who are interested, the 'Town Guard' rules are now available. This is the link for the basic rules. I'll be adding details and the complete accessories for a playtestable version over the next day or two. I've just finished up the basic rules document for the boardgame "Town Guard". Being uploaded now...(they would have been uploaded if it weren't for my terrible internet connection). A full playset should be available over the next few days for playtesting purposes. I do find it odd that some of my most viewed posts are the ones where I say "Nothing to say", or "Sorry I'm not posting much at the moment..."
University work is ramping up, and that means I haven't been posting as much as I'd like. Hopefully in the holiday break next week I'll be able to provide some more gaming insights. It's always surreal when reality starts doing the things that you've written about. In my game Walkabout, the spirits awaken when humans do too many stupid things to the planet and threaten to wipe out all life as we know it. Sacred places are desecrated, and ancient wards are breached...allowing demonic entities to stride the globe. Guardian spirits to step into punish both demons and those who inadvertently 'rescued' them. So, when the Peruvians did this, it gave me a bittersweet reaction. Thankyou for making the hypothetical situation in my game closer to reality. I for one can't wait for Peruvian mummy god-kings to start their havoc on the world. I think my "apocalypse survival kit" is ready to go. Town Guard is evolving from the ideas I had for a Quincunx boardgame. In the earlier evolution of the game, super-powered heroes would uncover supernatural mysteries in front of the cameras of a reality TV series. 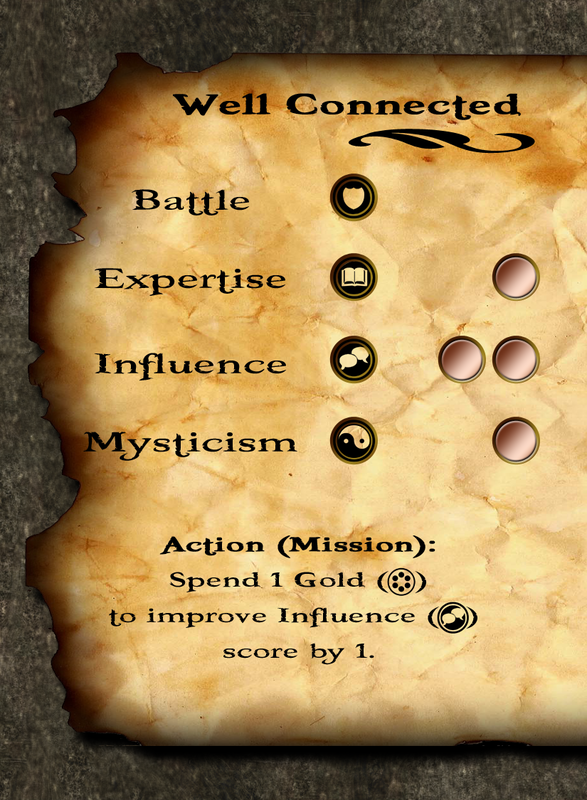 When I was developing Quincunx as an RPG, it used six elements and six types of action (where the combination of action and element determined a character's specific abilities). For the boardgame version of the game, I was going to strip the game down to 6 action types that drew on different resources at the character's disposal. This way you'd get different types of attack styles based on different elements, different skills, etc. But for an entry level board game, the combinations are a bit complex. So I stripped it down to 6 actions only...then stripped it further, down to 4 actions. Attack and Defence are combined into a "combat" score. Allies was removed. 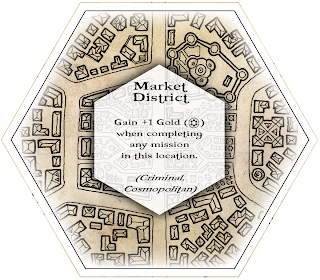 I'm working on some modular map components for the Town Guard game. 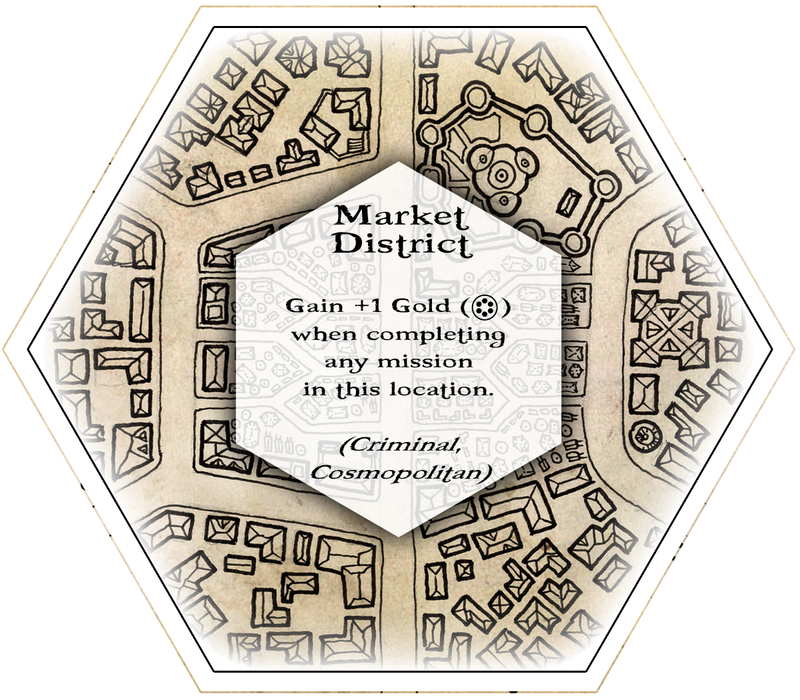 These will be printed onto hex tiles, and the first part of the game is to set up the town that you'll be guarding for the session. 8 down, 4 to go. The price calculations for the basic game mean that I can only fit 12 town segments into the box, but that should be enough for some interesting modular effects and replayability. I'm now considering options for colouring the maps and adding further details like texturing. Alright, maybe my first instincts were right...keep it simple....keep it elegant. Don't overthink it. Most of the classic games have simple names; names that tell you what the game is about in a few simple words rather than trying to push evocative arty imagery on the players. I like evocative and arty, but that sort of thing hasn't drawn the attention I'd often like my games to get. Maybe it's time to take a different course, just a simple name, a plain logo. The other night I watched the Dragon Age episodes of Tabletop. They were out a while ago, but I've only just managed to get around to watching them. It looks like pretty standard fare when it comes to a roleplaying game, but there was one innovation which looked pretty interesting to me. I will admit that I haven't read the Dragon Age books, I haven't played the games online, and my only exposure to the system comes from watching the videos...so my interpretation of this rule might be a bit skewed ("Tabletop" does manage to oversimplify a lot of the games that are depicted). The mechanism in question is the stunt point system. Seriously, if you need inspiration for a dark 1970's game set in England...this surely has enough inspiration for a campaign or two. Just go over there now. What do you do when other players are talking their turn? In boardgames this becomes a critical aspect of the design, sometimes accepted by the designer and sometimes neglected. When it's neglected, a group will often develop house rules. Case in point, Monopoly. It is typically expected that all players keep their focus on the table while the game is being played...even when it's not their turn. This is reinforced by a house ruling that states a player must specifically ask for the rent when another player lands on their property. If a reasonable time-frame passes and the active player either rolls again (due to doubles), or passes the dice to the next player, then the opportunity to collect rent has passed. It's a crude version of what I'm thinking about but it fits as a basic example.